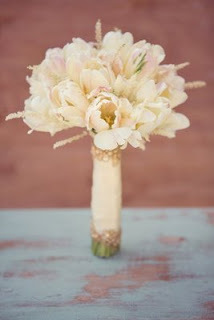 This centerpiece from www.weddingbycolor.com is a beautiful and elegant display of this spring flower. 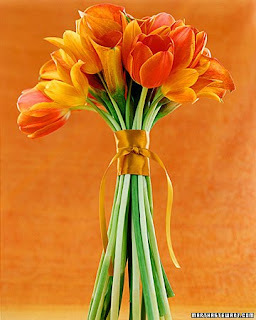 These tulips have their stems cut short to create a low centerpiece and are loosely placed in the vase to give them that "just picked from the garden" look. 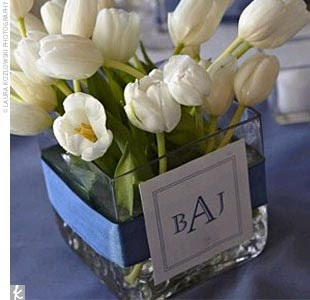 The off-white tulip is a classic, clean and romantic choice for a modern, formal affair. 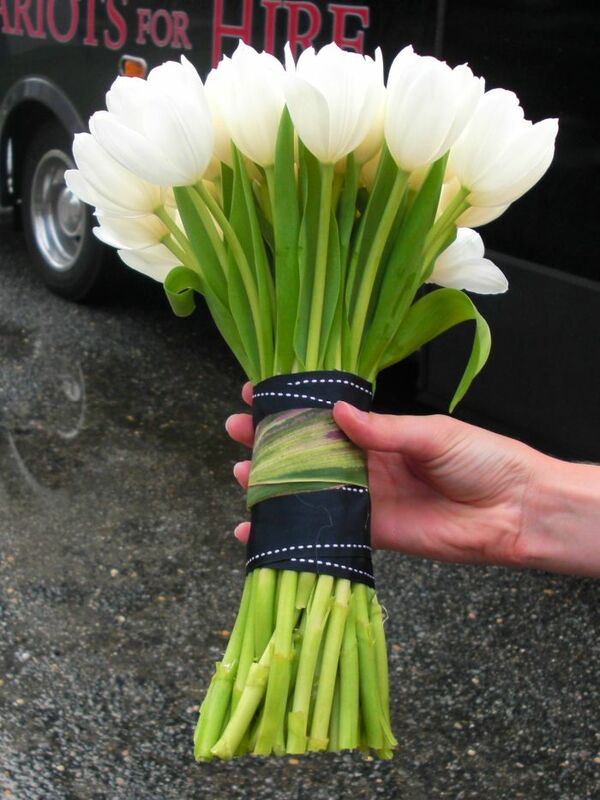 Here we have a modern spring bouquet featuring white tulips. The long stems and single flower design make this very modern and minimalistic and the flowers themselves have a look that is very clean and bright! 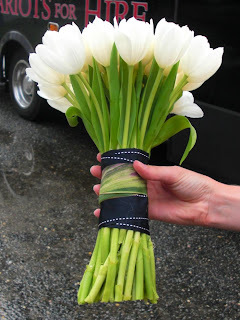 Plus, we love the contrast of the black ribbon! 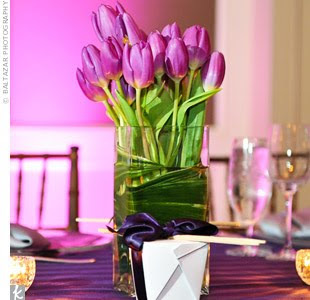 We are in love with these gorgeous purple tulips (and the cute favor box!). This is another great choice for the modern spring wedding. First of all, the shades of purple and glowing candles are beautiful and the centerpiece looks great with the contrast of the bright green stems! But, what we are really enjoying is the height of these flowers and the square vase they are placed in - it creates great drama! This is one wedding we would have loved to attend!! Looking for something a little more on the frilly, girly-girl, traditional side? Then we would suggest something like this pale pink bouquet of parrot tulip. Parrot tulips have kind of ruffly looking petals, as opposed to the very smooth petals of regular tulips, which is what gives this bouquet its light and feathery look. This vibrant bouquet of tulips paired with cala lilies would be perfect for a fun and unique spring wedding. The long stems are beautiful and elegant, but this bouquet is a bit more casual as it has that loose stems and casually tied bow. The bright pop of the cheery yellow and bold orange is sure to be a show stopper! You're Invited! Now What Do YouWwear? April Showers call for Rain Boots! Hot Spring Fashion: Tights as Pants!